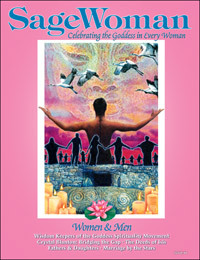 SageWoman #84 Women & Men (paper) [sw084p] - $10.95 : BBI Media - Magazines that feed your soul. We never expected to create an issue of SageWoman on the topic of “women and men.” But when we asked our social media fans last summer if they would appreciate a theme on this topic, we were overwhelmed with positive responses. So here we are. Although SageWoman is a female-only space, the vast majority of our readers live, eat, work, play, and just plain exist in a world full of men. We also now rub shoulders with a surprisingly diverse set of genders that weren’t even imagined when SageWoman first came into consciousness in 1986. Now, for the first time, we asked our readers to share their stories of experiences with men — fathers, sons, brothers, lovers and others. This issue — full of longing, love, compassion and healing — is the result. Wisdom Keepers of the Goddess Spirituality Movement. In this wide-ranging article, we introduce over seventy of the women (and the occasional men) who have made the Goddess community strong. A Year Without Men. There I was, moving — body, soul and worldly goods — into Woonsocket, into Womb-town. Unbeknownst to me, I was also about to get re-born. Earth Mother, Lilith, Sky Woman & Me. Growing up, the choices seemed only to be a male-centered, submissive slave or an anti-male, independent career woman. What I never saw, or was told, was that both of those so-called choices had nothing to do with me as a Woman. Same Journey, Different Paths. When my spouse and I first discovered the Goddess, we had animated conversations well into the night, but we never attempted to honor the Goddess together. Until the day we did, and found an entirely new aspect to our relationship. Out of the Rubble: A Father & Daughter Find Peace. I had relationships with men, but I kept one eye on the door at all times, ready to flee for my life when (as I assumed) the “other side, the bad side” of each man would inevitably emerge. Sooner or later, the men I dated pushed my Daddy buttons. Men & Women Welcoming Goddess Together I consider the primal consciousness of divine union, which I name Goddess, goes beyond our social definitions of masculinity and femininity. The Goddess is sun and moon, brightness and darkness. She is beyond our limited concepts. One of Ten Thousand: The Deeds of Isis. Of all the world’s goddesses, Isis is perhaps the most enduringly loved. Her name was a synonym for the Great Goddess, and She remains one of the most popular deities in our communities today. Isis is a mistress of magic, and as we shall see, she uses her powers to deal with the males in her life on more than equal terms. Plus: Susun Weed on the fae magic of lobelia; Donna Henes on asserting our sovereignity; marriage by the stars; summer Goddess baking; sculpting Goddess talismans; reviews, the Rattle, and so much more. 88 pages, published in Summer of 2013.